Synsphyronus sp., from Western Australian Museum. The Olpioidea was recognised by Harvey (1992) for the families Menthidae and Olpiidae on the basis of the presence of trichobothria on the pedipalpal femur. However, molecular phylogenetic analysis suggests that the Garypidae also fall within the clade formed by these families (Murienne et al. 2008). [H06] Harvey, M. S. 2006. New species and records of the pseudoscorpion family Menthidae (Pseudoscorpiones). Records of the Western Australian Museum 23 (2): 167–174. [H09] Harvey, M. S. 2009. The first Australasian species of the halophilic pseudoscorpion genus Paraliochthonius (Pseudoscorpiones: Chthoniidae). Records of the Western Australian Museum 25 (3): 329–344. [H10] Harvey, M. S. 2010. Two new species of Synsphyronus (Pseudoscorpiones: Garypidae) from southern Western Australian granite landforms. Records of the Western Australian Museum 26 (1): 11–22. [H12] Harvey, M. S. 2012. 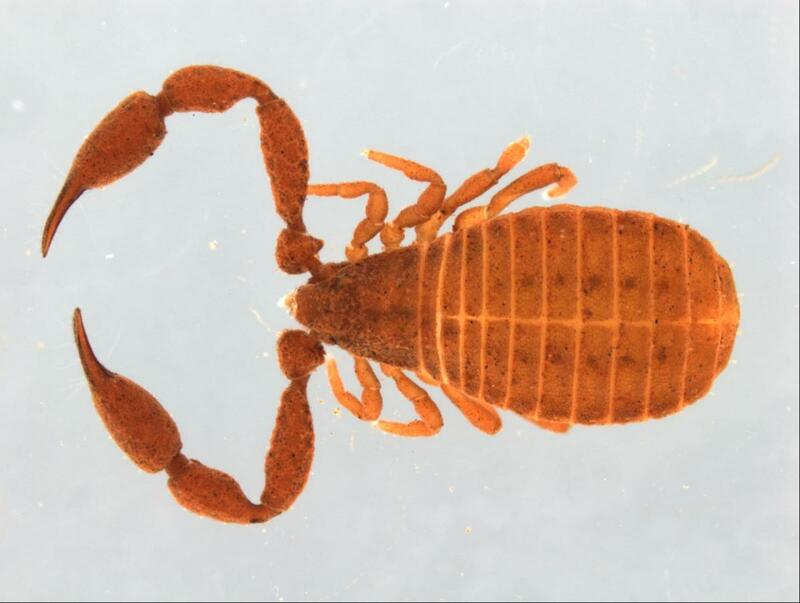 A new species of Synsphyronus (Pseudoscorpiones: Garypidae) from Western Australia. Records of the Western Australian Museum 27 (1): 55–61.